Our tour started in Shanghai, where Prof. Li Wei from Fudan University, helped us arranging meetings in Tencent, his own department and the Department of Music Engineering in Shanghai Conservatory of Music, so here we express our gratitude to his help. Tencent is one of the giant social-networking and e-commerce companies in China, and since one year ago they started offering music related services. We met the team working in music related tasks in Shanghai, who showed interest in some of the work carried out in the MTG. Prof. Li Wei’s students from the Institute for Media Computing in Fudan University, one of the most prestigious universities in China, surprised us for their knowledge of the state of art in the field of music computing and their fluency in English, something that was not common just few years ago, according to our own experiences. Prof. Li Wei himself is an active promoter of sound and music computing in China, a field that is still in its infancy in this country, having organised two editions of a national workshop which aims at joining forces among the local researchers. In Shanghai Conservatory of Music, we hold two meetings. In the morning, we met with some of the faculty and students of the Department of Music Engineering, leaded by Prof. Chen Qiangbin, and focused mostly in electronic music composition. In the afternoon, we hold a public presentation hosted by the Department of Musicology and arranged by Prof. Dai Wei, lecturer on Chinese music history and very fine guqin player. The efforts of Prof. Dai Wei in arranging this event and her kindness to us deserve a special mention of gratitude here. In our presentation we had an attentive audience of more than forty people, including professors and students from the conservatory and some jingju aficionados. We had the opportunity to have some interesting conversations afterwards about the possibilities and difficulties for the application of the tools we presented. For our last day in Shanghai we went to the city of Ningbo, at two hours train distance in the South of Shanghai. We presented our work to some faculty and students from the Music Department of Ningbo University College of Arts, led by Prof. Yu Hui, a pioneer and active promoter of digital musicology in China, having organised the first international symposium on this topic in the country just last April. After our trip to Ningbo, we moved to Beijing, where we hold the majority of our meetings. We visited two companies, Dolby and Douban, where we had private meetings. Researchers in music related tasks from the latter, have known our research in the MTG for long and have started some collaboration with us. We would like to acknowledge the help offered to us by Jason Chao from Douban in organising this trip. We also visited music technology related groups in Peking University, Communications University of China (CUC) and Tsinghua University. The Digital Audio Research Lab of Peking University, probably the top university in China, is led by Prof. Chen Xiao’ou and Prof. Yang Deshun, who together with their students received us in their lab. In CUC we met Prof. Wang Xin, who introduced to us their current research, mostly focused in reception studies of Western and Chinese instrumental music. In our visit to Tsinghua University, the traditional “rival” of Peking University for the highest position in Chinese universities rankings, we went to the School of Software, where we met Prof. Wang Chaokun and his graduate students, whose current research is mostly focused in recommendation systems and social networks. After our presentation, two of the PhD students in the group presented their recent work, and surprised us by the high quality of their work at international standards. We also visited the two music conservatories in Beijing, the Central Conservatory and the China Conservatory. 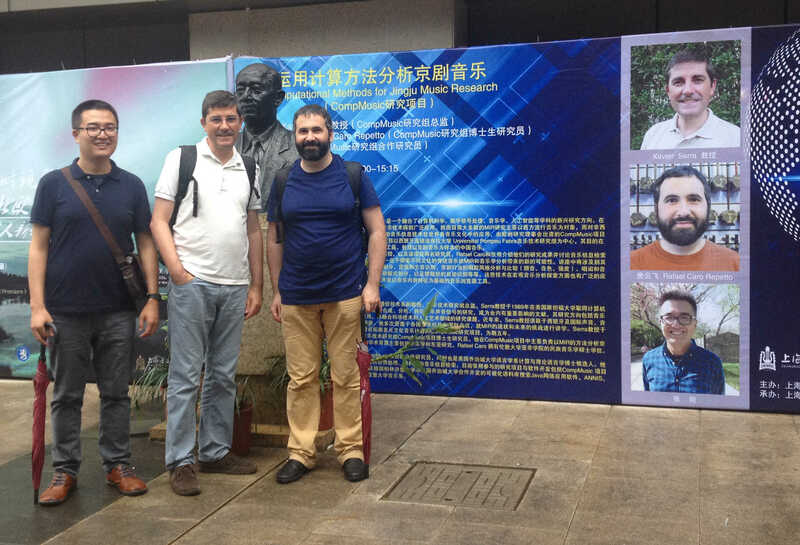 In the first one we were received by Prof. Kenneth Fields, lecturer in the China’s Electro-Acoustic Music Center and composer of electronic music. Prof. Han Baoqiang, head of the Music Technology Department in China Conservatory, had organized a Forum on Digital Musicology, in collaboration with the Musicology Department, consisting in two lecturers, one by Prof. Yang Jian, from Nanjing University of Arts, and our own one, followed by an open discussion with the audience, that during our talked reached around fifty participants, including professors and students from the conservatory and other institutions. We were also invited by the Peking University Chinese Music Institute (PKUCMI), a student society that puts together a Chinese traditional orchestra with ninety members and a centre for music research. They offered themselves to record our presentation and share the video with us. We were very impressed by the accurate organisation of the event by these committed students, and the warm welcoming they gave us. For that, we want to thank Ms. Emily Zhang, the president of the PKUCMI, and our hosts Ms. Tina Wang and Dr. Li Rongfeng. Since our research in jingju includes aspects related with linguistic features, we were received by Prof. Li Aijun and Dr. Yin Zhigang from the Phonetics Lab in the Institute of Linguistics of the Chinese Academy of Social Sciences. Our talk was addressed to researchers in this lab, who, although their main work is related to linguistic issues, are also very interested in the music-language relationship, especially in Chinese traditional operas. The institution from which we arguably can obtain a most direct and closer collaboration is the National Academy of Chinese Theatre Arts (NACTA), the highest institution for training of jingju actors and musicians. Our visit to NACTA was hosted by Prof. Hong Wei from the Music Department, and his master student Dong Wenweike, whose attention and kindness to us needs to be acknowledged here. In the morning, Dong Wenweike took us to different classes to see how jingju musicians and actors are trained, where we witnessed how this art still relies heavily on oral transmission by imitation of the teacher. We then met with Prof. Xie Zhenqiang, head of the Music Department and composer of Chinese opera, and several professors from the same department. We had a fruitful conversation with them, from which future projects in common where suggested. Finally, we hold a public presentation in the evening, attended by many students and some faculty members from the Music Department. From all of these visits, we can make the following conclusions. First of all, the field of MIR in China is still in its infancy. There are some notable researchers working in computer music related topics, but their work is mostly isolated in their respective departments. We sensed from them willingness on expanding the field in China, and they are putting a big effort in training young researchers in these topics. We noticed also that collaboration between engineers and musicologists or musicians is still not very frequent. There are, however, some initiatives to promote digital musicology that will bring together these two areas. In this aspect, Prof. Yu Hui from Ningbo University, and Prof. Han Baoqiang from China Conservatory are very active. In the case of musicology departments, many scholars showed interest in the computational tools we presented, but they also showed concern about their usability in their own work and still don’t relate themselves to this kind of approach. Overall, we noticed a high quality on the training of the young students of music computing and their work, especially remarkable in Fudan University and Tsinghua University. In terms of future collaborations, no specific terms were discussed during the tour, but we found a lot of potential in defining future projects with some of the institutions we visited. To finish, we would like to remark that our journey did not only concerned academic activities. We had the opportunity to enjoy Chinese hospitality in each of the meetings we had. We were treated generously by all our hosts, who took us to splendid luncheons and dinners, where we had the chance to enjoy Chinese cuisine at their best. For that, we would like to thank all our kind hosts. And we also had time for listening to music as well. In Shanghai, we unexpectedly witnessed two samples of religious music, a Daoist rite in the City God temple and singing of Buddhist classics by an all female congregation of more than one hundred members in the Chen Xiang Ge temple. But of course, we mostly attended opera performances. In Shanghai, we went to the Yi Fu Theatre, where we saw a contemporary play of huju, Shanghainese opera, which let us experience the innovations developed in these genres nowadays. In the Mei Lanfang Theatre in Beijing we attended a double feature jingju performance, including two traditional plays, The Lion Mansion, and Yao Qi. The latter, starred by Wei Jijun, celebrated the 100th anniversary of the birth of Qiu Shengrong, the founder of the Qiu school of the jing role-type. Wei Jijun delighted the audience with a powerful vocal display, supported by a cast of outstanding actors and actresses. We also attended three performances in the Chang’an Grand Theatre (where coincidentally we met the jingju scholar Elizabeth Wichmann). These performances, instead of full plays, consisted of different scenes, a popular format for opera representations. Between the three performances, we had the chance of listening samples of jingju, kunqu, yueju (Cantonese opera), qinqiang (Shaanxi opera), huangmeixi (Huangmei opera), zangju (Tibetan opera, very rarely performed outside Tibet) and yueju (Shaoxing opera). Finally, we also had time to attend a symphonic concert in the National Centre for Performing Arts, an impressive building just next to Tian’anmen square that includes an opera house, a theatre stage and an auditorium. This was a very intense and exciting journey. Along it we have learnt about the current status of music technology research in China and the situation of traditional operas, but also about the university system in this country, the kind of work carried out by different companies in the field, the research environment for Chinese scholars and students, and the potential and handicaps for their international expansion in general and possibilities for collaboration with us in particular. We came back to the MTG with the feeling of having lived a very fruitful experience, both in academic and personal terms, and hope that the bonds we established in this occasion will be strengthened in the future. Some impact in Chinese media: WenHui News, China News, China Musicology Network, China Conservatory News.